Facebook. Twitter. Google+. Pintrest, Instagram, LinkedIn. They all have become mainstream words we use in our everyday conversation. They have penetrated all forms of media including print, TV, radio, video and digital. It would almost seem strange not to hear or see those familiar icons. For a long time, there seemed to be a perception that only younger people (under 25) were “on” social media. So why then are companies putting so much time, effort and money into using social media platforms for marketing, branding and engagement to a small segment of the population? Many web sites enable you use your Facebook, Google+, Twitter or LinkedIn accounts to sign into other accounts such as Pinterest, TripAdvisor, etc. Some companies provide the ability use your social accounts such as LinkedIn to apply for jobs. 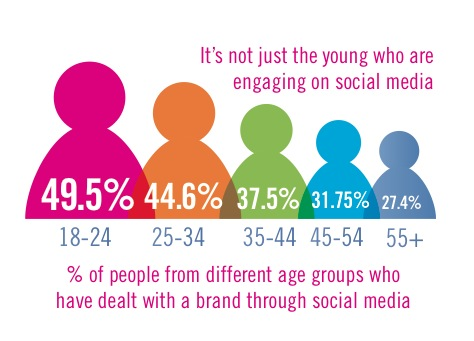 So it’s not just young people who are using social media channels. As social media becomes more intertwined with consumer marketing, recreational activities and personal transactions (such as banking), it encourages more people across a wider demographic to use these channels. Mobile technology also offers social media as a core part of their smart phones (including tablets) which make social media channels readily accessible and easy to use on the go. In the last two years we can see a steady increase across all demographics of people using social media. No surprise that the highest usage is the under 25 age group. But what we are seeing is the year over year increase of people over 45 using social media. In just one year the 45-54 age group increased 10% shifting to more than half of that demographic now using social media channels. Another interesting observation is an 8% increase of those 65 and over using social media between 2011 and 2012. The marketing of social media on traditional channels has increased conversion to use these channels and apps to engage and perform transactions. The upsurge in usage for those 55 and over may also be attributed to the way they have determined how the use social media. Research shows that as people get older they tend to take a more thoughtful approach to social media; separating their professional and personal social channels such as Facebook and LinkedIn. Friends and network connections tend to be people they know, instead of casual acquaintances. Increased ability to control privacy settings also make people feel more secure about social networking and sharing information. As more people start to use social media we also see them expanding and using a variety of different channels. If we think about personal usage on channels such as Facebook we can see in the chart below, there is a broad distribution of users across all demographics. 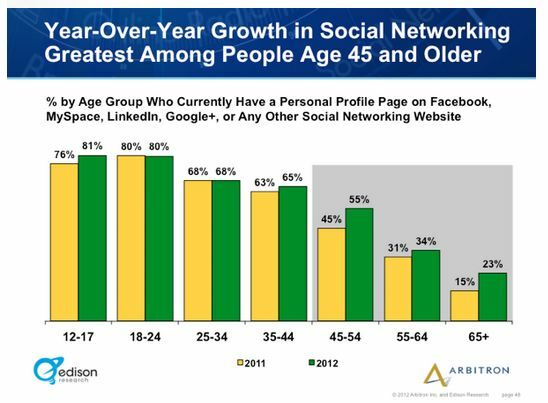 If we look at LinkedIn, we can see more usage for those over 25, the highest among those in the over 55 age bracket. Twitter on the other hand has broader usage for those under 25 and the least amount of usage for those over 55. What they all have in common, are all demographics are using these channels, but at a different capacity, based on what they deem the channels are useful for. What we will start to see is a rise in channels like LinkedIn for those under 25 looking to build their professional profile. The results show us that social media is being used by all demographics. With technology making it easier to connect we can expect to see a continued rise in the number of “older” people using social media. This is key if you are thinking about possible avenues to market your products, services and jobs. Consider where you could source your next new hire or business opportunity from using a social media platform. In my last blog post I talked about some social etiquette tips that should be taken into consideration if you are looking to network with others. 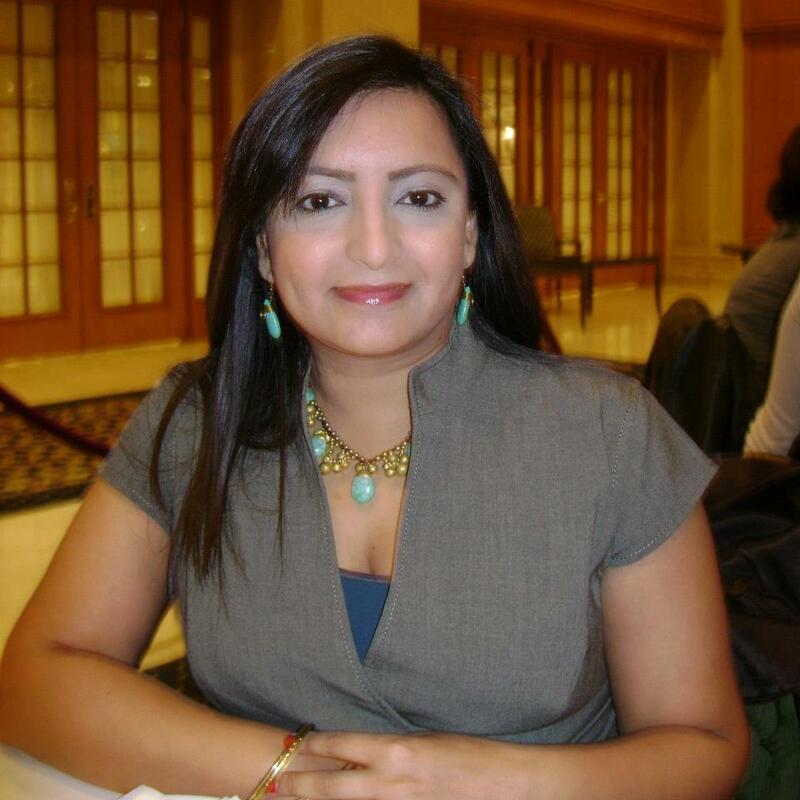 My focus was on LinkedIn as the primary professional social networking platform. In this blog post I am going to turn my attention to the other major personal social networking sites like Facebook, Twitter, Orkut, Google+, etc. These personal social networking platforms are being used for both personal and business, thus bringing their own set of etiquette rules. Friending– Most people use Facebook/Google+/Orkut,etc. as personal networking and communication vehicles. Statistics show that younger people are more open to sharing information and receiving friend requests from people they casually know. As we get older we tend to be more selective about who we want to share our personal information with. It can be awkward to receive friend requests from people you interact with in a business context but not a personal context. Etiquette rule #1– Friend requests should be sent to people you know on a personal level. Use LinkedIn to connect on a professional basis and use your personal social networks for friends you know on a personal basis. Spamming– Are you posting or sharing tons of content every day all day? Consider how this shows up in your friends news feeds…there is a word for you. Spammer! Your friends don’t want to know everything your doing. Etiquette rule #2– Don’t over communicate. Be considerate, post and share relevant content. Many Facebook users are becoming more savvy, adjusting their friend settings to stop spam. So if you are spammer, chances are the content you’re posting isn’t being read by anyone. Posting bad photos– Social sites are a great place to share photos. Mobile apps allow you to upload pictures and tag your friends in an instant. Sometimes those pictures are a great representation of you, but aren’t the best representation of your friends. Remember when you tag a picture your friends and their network see the picture. I’ve seen many Facebook posts asking friends to take down pictures they feel are in bad taste. Etiquette rule#3– Don’t’ upload and/or tag of your friends in pictures that make them look bad. It may be a sure fire way to get un-friended pretty quickly. Wall post or private message? Have you ever read a post and thought to yourself, why did they post this for everyone to see? Remember that even with strict privacy settings, when your friends comment on, or like your post, their friends’ network can see that post and its comments in their news feed. Facebook has enabled its users to create specific lists (see my previous blog post on privacy) to share information to specific people. In some cases you may even want to send a private message to someone. Etiquette rule #4– Some things are not meant to be a public status updates. Use judgement when posting information. If you don’t want to share to your broader network consider sending a private message. @what? So you’ve decided to use your personal Twitter handle for business use. Names like @sexygodess or @biteme may not get the response you are looking for, especially if you are a Recruiter. Etiquette rule#5– Consider having a professional name for your Twitter handle. Your response rate and followers may just increase! Direct Messaging– Just like sending an email to someone, direct messaging on Twitter sends your message to an individual’s Twitter inbox. If you’ve set up an auto-broadcast this can cause spamming, not to mention it’s super annoying! 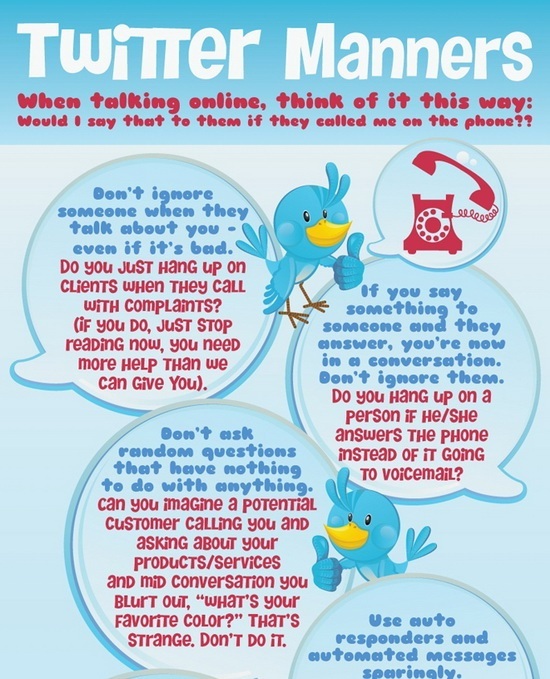 Etiquette rule #6– Don’t spam individual’s Twitter handle by frequently direct messaging them. Use direct messaging only when you want to send a private message to an individual. 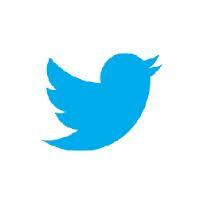 Following– It’s important to follow people/companies on Twitter to build up your fan base. Twitter is a communication and engagement channel. Etiquette rule # 7 – Don’t follow people and then unfollow them once they follow you. I am sure there many other social etiquette rules you can think of that I haven’t covered. One social etiquette rule that I think transcends any social networking platform is to – Share. Have you come across a job posting that maybe useful for a friend? A relevant article or a contact that may benefit from an introduction to someone in your network? Most important etiquette rule # 8 Pay-it-forward. Fundamentally social networking is all about sharing. Share helpful information and support others without expecting something in return.